Hal and Ken Griffith, the father and son owners of Pier 57 and the waterfront Ferris wheel, spoke to my class this week about their proposal for a short gondola system in downtown Seattle. As mentioned in a previous post, I went into the discussion being highly skeptical. This is a private project being proposed for private ownership and benefit in the public right-of-way. The presentation shifted my view slightly but there are still valid concerns that must be addressed before the City of Seattle can consider approving the project. The gondola proposal comes after the Griffiths opened a 175 feet tall Ferris wheel in 2012 on Pier 57, where they also operate the Miner’s Landing amusement center. The wheel was intentionally designed and built quietly, avoiding both public comment and media attention. In their presentation the Griffiths candidly admitted to this and wish the same could happen for the gondola project. The wheel is a great addition to the waterfront, but the fact that they avoided transparency is immediately suspect. I surmised that the Griffiths had reached out to my professor and were talking to us students in an effort to increase their legitimacy. The Griffiths said the project is primarily about customer access. With the waterfront reconstruction underway, much of the parking under the Alaskan Way Viaduct has been removed. The Griffiths said downtown parking garages are full when many customers try to visit, but this is entirely false. Recent data from the Puget Sound Regional Council shows that downtown parking garages are underutilized and only 50-70 percent occupied at any given time. Regardless, the Griffiths found that the Washington State Convention Center garage is even less utilized and connected to Pier 57 by a single route, Union Street, so the idea is to connect the two. A midway-station would be located at First Avenue. They say the system could move 1800-2000 people per hour each way and the full trip would take about 10 minutes, which at a half-mile long replaces a…10 minute walk. The Griffiths’ then put up a straw man, saying this is much cleaner and quieter than the equivalent of 50 buses per hour. But no one is suggesting buses shuttle people up and down the hill, and the cleanest form of transportation is by foot. Admittedly, the hillclimb on Union Street (above images) is steep and not as attractive as it could be. The Griffiths say that this is an obstacle for families and other mobility-impaired customers who park further up the hill. But that brings up multiple alternatives to a gondola for getting up and down the hill. 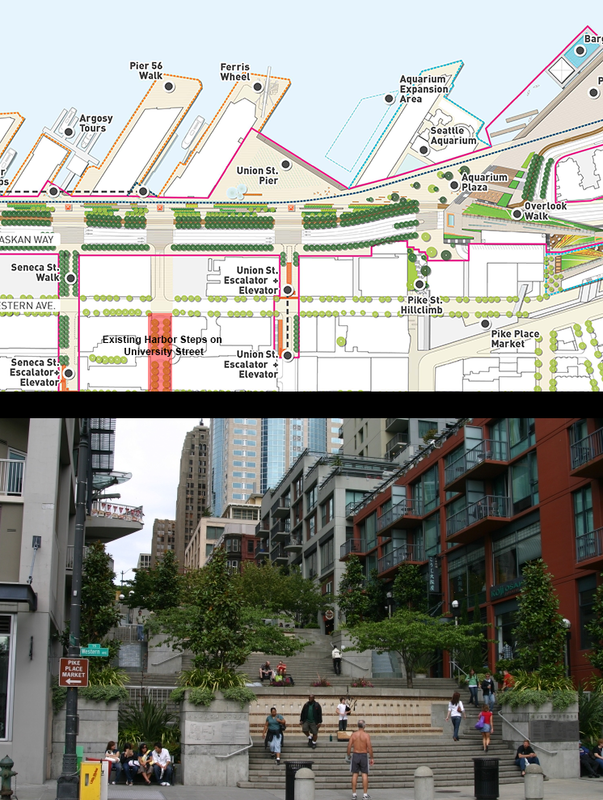 The waterfront redesign plan, including Union Street escalators and Pike Place ramp (above), and the existing Harbor Steps on University Street (below). Click to enlarge. The University Street Harbor Steps are only one block south and offer a convenient route for pedestrians. 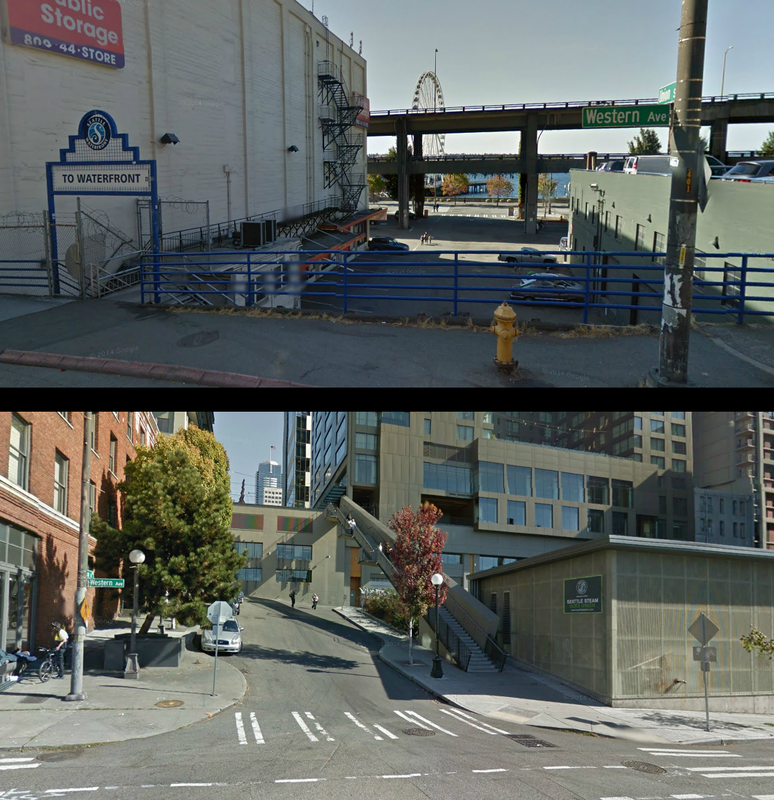 Also, the ongoing waterfront redesign has escalators and elevators on Union Street and a large ramp connecting Pike Place with the waterfront two blocks north. (Correction: The Union Street improvements are already going through the permitting process.) If these are not adequate for getting people to the waterfront, which I doubt, the Griffiths could pay for a similar stair project in the right-of-way at Union Street. This would cost them much less than a gondola, improve pedestrian infrastructure where it is needed, and be free to use by everyone. Besides, the gondola can’t be built until the viaduct is demolished, which was originally scheduled for 2016 but may be delayed. The waterfront reconstruction is planned to be complete by 2019; three years or less is not much of a wait in process-heavy Seattle. The other pedestrian impact could be on other local businesses along Union Street. The gondola would remove potential customers and rob people of the city experience at street level. The Griffiths speculate that when people see interesting attractions from above they will want to double back on foot, but the kind of people who drive downtown to ride in an enclosed canopy probably aren’t interested in urban window shopping. Gondolas are an increasingly popular choice around the world for urban transport where they can connect with significant public facilities and transit networks, but in this case the gondola would primarily be used by car drivers and does not integrate at all with local transit. The Griffiths estimate the construction cost at $30 to 50 million and say any additional cost of acquiring public right-of-way access could kill the project. This is my main concern; the City of Seattle can and should charge the Griffiths for this intense use of public space for a private transportation system. The Griffiths argue that the gondola would be a public benefit, because people could more easily access the waterfront (and thus their business) and make better use of existing parking infrastructure. But fares would not go to public coffers and the system may not even incorporate the ORCA card for payments. The Griffiths estimated an all-day ticket cost at five to eight dollars. Another issue is the three elevated stations would be enormous and may cover up entire block lengths, further degrading street life. The bottom of the gondolas, and therefore the stations, would be a mere 30 feet above the ground. At any height there will also be privacy concerns for adjacent offices and residences. Allaying one concern, the eight supporting towers would be located somewhere on the side of the street and curve out over the center. Replacing an on-street parking space would be much more acceptable than taking up sidewalk space, of course, but beyond avoiding utility lines the tower configurations have not been detailed. I applaud their creativity and proposal to promote better east-west connections, which are are sorely needed in this city. And there’s nothing wrong with spurring the local economy. There is a separate gondola proposal to speed transit along traffic-choked Denny Way, which makes more sense. Nearby, Portland connects a university to its downtown with a gondola and Vancouver, B.C. is seriously considering one for connecting to its university. 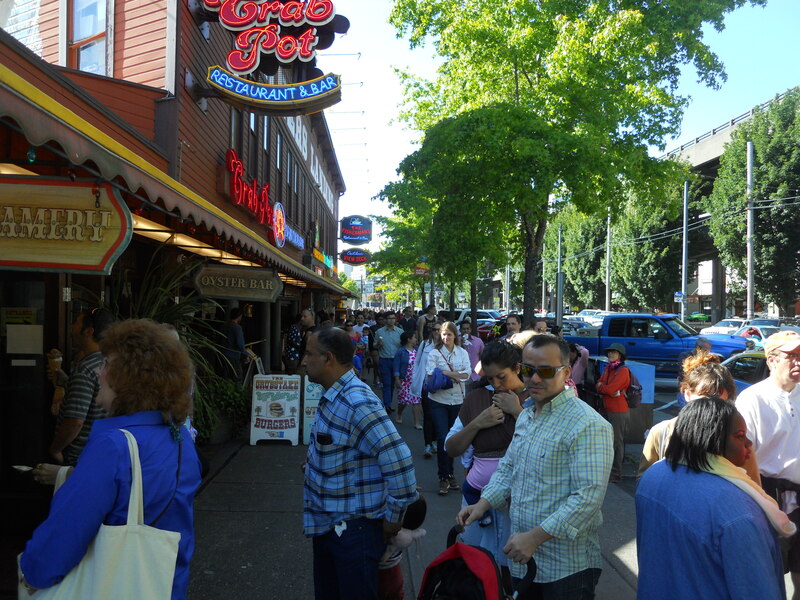 And the Griffiths have a vague idea to extend their line to Capitol Hill, which would be a useful link. The waterfront is often crowded already. But reading between the lines, it is obvious that this is primarily a private business-driven proposal. The Griffiths say they can pay for it alone even though a gondola could help other waterfront businesses; it’s likely they are not attempting to share the cost with their neighbors because the others would want to share revenue. If and when the proposal moves forward, the City of Seattle must hold that any private project in the public right-of-way has clear and equal public benefits. The Gondola Seattle website (unofficial; the project has no official site yet) offers similar arguments. This entry was posted in Government, Transportation and tagged aerial tram, arguement, business, family, ferris wheel, gondola, Great Seattle Wheel, Griffith, Miner's Landing, opposed, Pier 57, project, proposal, public, redesign, right-of-way, Seattle, Union Street, waterfront. Bookmark the permalink. New plans being floated by the Griffiths call for a stop at the midway station ONLY on the way back up. If you want to get out there to visit the Pike Place Market, let’s say, you need to ride all the way down and back up to get out. That is very interesting, do you have a source? I would think that would mess up the timing of the gondolas between both directions. I think it’s in the plans that are posted on the Gondola Seattle site.